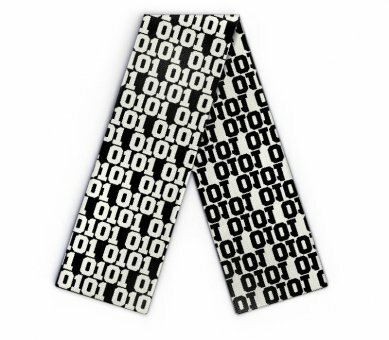 Edit design Binary scarf , or create your design from scratch. Enjoy this geeky custom scarf design: the binary scarf. Knitted with your favourite ones and zeros. Create your personal code sequence, and have the patterning of your dreams knitted in. Infinity scarf style is calling. Personalize it with name, text, logo, in the colors of your choice.